I reported earlier today about Fargginay’s Bacon cologne – of which I have some on order. J&D’s (that stands for Justin and Dave) have a mission to make everything taste like bacon. They started with Bacon Salt® – three flavours of Original, Hickory and Peppered, then some more exotic specialised salts in the form of Applewood, Jalapeno, Mesquite, Cheddar and Maple Redux. Moving on from that they converted mayonnaise to Baconnaise™. They have a popcorn range called BaconPOP™, and a product to excite office workers who lick envelopes for a living in the form of J&D’s Bacon-Flavored Mmmvelopes™. Bacon lip balm - make yourself taste like bacon! 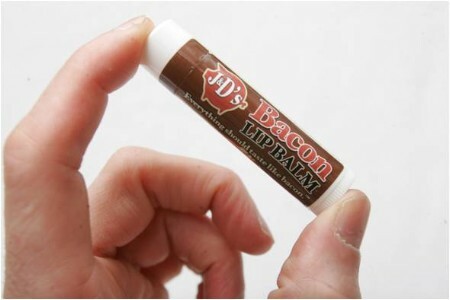 Now it’s J&D’s Bacon Lip Balm – to make yourself taste like bacon. Sadly – otherwise I’d be dragging the credit card out of my wallet once more, in the spirit of research – it’s not available for delivery to New Zealand. Just to let you know that they do deliver to the UK and have already ordered one for my other half! Thanks Tonia – looking forward to hearing how it is for you and your other half. Likewise, when I receive my Bacon cologne I’ll review it for the Meateater community. Alan…looking forward to hearing about that!! It’s a hit or miss with bacon cologne isn’t it? You’re either gonna love it or absolutely hate it. Would be interesting to hear what your friends/family think of it too. I think my boyfriend would love the Bacon Lip Balm. He always uses lip balm (please don’t tell him I told you that!) and he absolutely loves bacon so a winning combination for him hey? Have you tried it already? Does it have an authentic bacon taste? Also I checked the website to see if they deliver to the UK but I can’t find any info. Do you know if they do? I did a Google search – no luck for any suppliers in New Zealand – it did however show an old trade on TradeMe that was selling brand new jars of Bacon Salt from J&D’s – maybe keep looking there. Depending on where you live it might be best to find the biggest and best delicatessen or food-lovers shop to see if they stock it. In Wellington I’d try Moore Wilsons. In Auckland I’d try Sabato or similar.